Quinton T. "Bill" Barlow, 75, a retired Marine Corps sergeant major who was later chief of security at the World Bank, died of cancer April 6, 1998 at home in Vienna, Virginia. Segeant Major Barlow served in World War II, the Korean War and the war in Vietnam. He was awarded the Navy Cross, his service's highest award for valor after the Medal of Honor, for his role in rallying his men to repel an attack by numerically overwhelming enemy forces near Panmunjom in Korea on April 16, 1952. According to the citation accompanying the award, then-Technical Sergeant Barlow "organized a defensive perimeter and, despite intense enemy mortar and small-arms fire, moved from position to position, shouting words of encouragement and aiding the wounded. With the hostile forces formed for the final assault, he led the fight to repel the attackers, succeeding in dispersing the enemy within five yards of the defensive ridge." Sergeant Major Barlow was born in North Carolina. He served 26 years in the Marine Corps, retiring in 1970. On his military retirement, he settled in this area and joined the World Bank. He retired there as chief of security in 1984. He was a member of St. Mary's Catholic Church in Washington. His avocations included gardening and working his farm in North Carolina. Survivors include his wife, Marie Barlow; six children, Daniel Barlow of Ohio, Maureen Finley of California, Eileen Akers of Nashville and Dominic Barlow, Doreen Tisone and Celine Zapolski, all of Fairfax; 18 grandchildren; and five great-grandchildren. The Navy Cross is presented to Quinton T. Barlow (376508), Technical Sergeant, U.S. Marine Corps, for extraordinary heroism in connection with military operations against an armed enemy of the United Nations while serving as a Platoon Sergeant of Company E, Second Battalion, Fifth Marines, First Marine Division (Reinforced), during action against enemy aggressor forces in the Republic of Korea on 16 April 1952. When a reinforced platoon outpost was subjected to a night attack by a numerically superior enemy force employing a barrage of mortar and artillery fire, Technical Sergeant Barlow immediately assumed command and, reorganizing his platoon into a tighter defensive perimeter, assisted his unit in maintaining control of the outpost. Directing the displacement of two light machine guns when the enemy penetrated into the position, he again organized a defensive perimeter and, despite intense hostile mortar and small-arms fire, moved from position to position, shouting words of encouragement and aiding the wounded. With the hostile forces formed for the final assault, he led the fight to repel the attackers, succeeding in dispersing the enemy within five yards of the defensive ridge. By his daring initiative, inspiring leadership and outstanding courage, Technical Sergeant Barlow served to inspire all who observed him and upheld the highest traditions of the United States Naval Service. 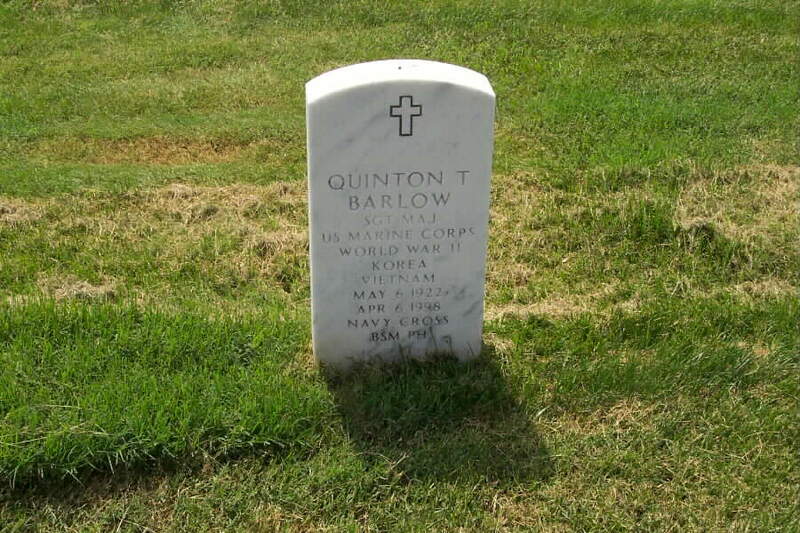 On Monday, April 6, 1998, QUINTON T. BARLOW, of Vienna, VA, beloved husband of Marie T. Barlow; loving father of Daniel and Dominic Barlow, Maureen Finley, Eileen Akers, Doreen Tisone and Celine Zapolski. Mr. Barlow is also survived by 18 grandchildren; five great-grandchildren and his brothers, Fred and Don Barlow. Mass will be offered at St. Mary's Catholic Church, 727 Fifth St., NW, Washington, DC, Monday, April 13, 1:15 p.m. Interment to follow at Arlington National Cemetery. Contributions may be made to Hospice of Northern Virginia. On Friday, March 16, 2007, MARIE T. BARLOW of Vienna, Virginia. Wife of the late Quinton Barlow; beloved mother of Daniel Barlow, Maureen Finley, Dominic Barlow, Eileen Akers, Doreen Tisone and Celine Zapolski; sister of Jack Golden. Also surviving are 19 grandchildren and six great-grandchildren. Mass of Christian Burial will be held on Monday, March 26 at 9:30 a.m. at St. Mary Mother of God Catholic Church, 727 5th St. NW, Washington, D.C. Graveside services will be held at 2 p.m. at the Arlington National Cemetery.